Actors Ron Perlman, Theo Rossi and Dayton Callie, stars from the FX original series “Sons of Anarchy,” are used to drawing crowds of fans wherever they go, but when the trio rolled onto the grounds of Marine Corps Air Ground Combat Center (MCAGCC) 29 Palms for a USO visit they were greeted by some of their favorite fans, U.S. Marines and their families. 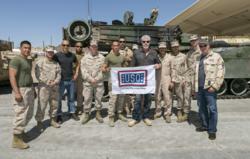 Perlman, who stars as club president ‘Clay Morrow,’ along with fellow cast mates Rossi, who plays club member ‘Juice’ and Callie, who portrays club ally and retired top cop ‘Chief Unser,’ recently took time from their busy schedules to show some love to troops and their families stationed at MCAGCC 29. The actors spent the day signing autographs, posing for photos and getting up close and personal with their military fans. This was the first USO tour experience for Perlman and the second USO experience for both Rossi and Callie. In 2010, the duo, along with fellow cast member Kim Coates and Mark Boone Junior, visited more than 2,000 service men and women stationed overseas in Kuwait and Iraq. Rossi studied acting at the prestigious Lee Strasberg Theater Institute in New York and has appeared in hit television shows such as “Las Vegas,” “Lie to Me,” and “Terminator: The Sarah Connor Chronicles.” When not filming Rossi is a big supporter of U.S. troops and works with several organizations, including the USO, to help raise awareness and funds for the military community. Best known for his role as ‘Charlie Utter’ on HBO’s “Deadwood,” veteran actor Callie’s career spans an impressive two decades and includes appearances in over 20 off-Broadway stage productions as well as roles in film and television including “K-Ville,” “CSI: Crime Scene Investigation” and “Derailed,” among other projects.